Today's post includes two of my very favorite gluten-free desserts. In fact, they are so good, that they are worth making even if you don't have any gluten-free guests! Preheat oven to 300F with rack in middle. Trace a 7-inch circle on a sheet of parchment paper and put on a baking sheet. Whisk together sugar and cornstarch in a small bowl. Beat egg whites with a pinch of salt using an electric mixer at medium speed until whites hold soft peaks. Add water (whites will loosen) and beat until whites again hold soft peaks. Increase speed to medium-high and beat in sugar mixture 1 Tbsp. at a time. After all sugar has been added, beat 1 minute more. Gently spread meringue inside circle of parchment, making edge of meringue slightly higher than center. 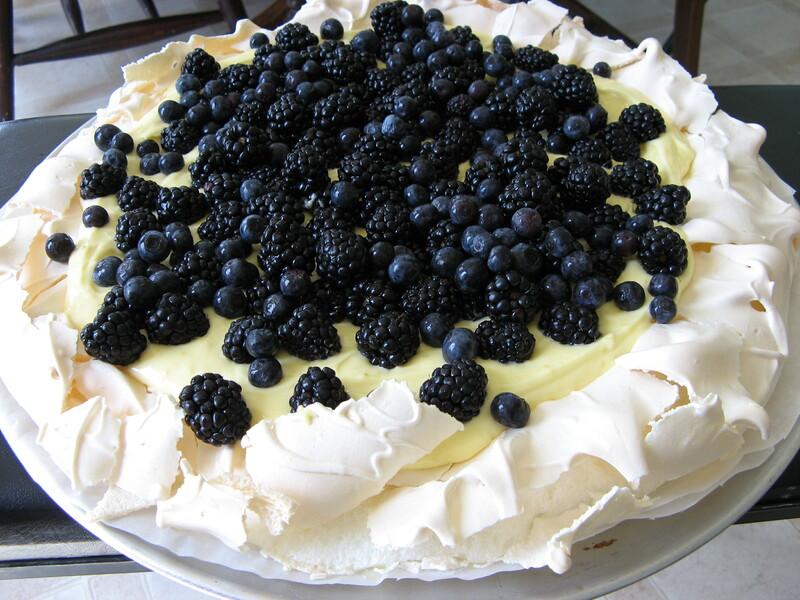 Bake until meringue is pale golden and has a crust, about 45 minutes (the inside will be like marshmallow). Stir together sugar, cornstarch, and salt in a 2-qt heavy saucepan, then add lemon juice and butter. Bring to a simmer over medium-high heat, whisking, then continue to simmer, whisking constantly, 1 minute. Lightly beat yolks in a small bowl and whisk in 1/4 cup lemon mixture, then whisk into remaining lemon mixture in saucepan. Reduce heat to low and cook, whisking constantly, until curd is thickened, about 2 minutes (do not let boil). Transfer to a bowl and stir in zest. Chill, surface covered with parchment, until cool, about 1 1/2 hours. Meringue can be made 2 days ahead and frozen, wrapped well in plastic. Thaw before serving. Curd can be made 2 days ahead and chilled. Chocolate cake is always a popular dessert. This gluten-free version has intense chocolate flavor which is balanced by the cloud of whipped cream and fruit we like to top it with. The only tricky thing about this cake is the cooking time -- don't be tempted to overcook this cake as it will be dry and rock-like when hard. Pull it out of the oven while it still has a bit of wiggle. Place a rack in the middle of the oven and preheat the oven to 350F. Butter a 10-inch fluted tart pan or a 9-inch springform pan. The pan must be at least 1 inch deep or the batter will overflow. Melt the chocolate and the butter in a microwave-safe bowl for 2-3 minutes at 50 percent power or in a heatproof bowl set over a saucepan of simmering water. Stir together with a rubber spatula until smooth. In the bowl of a stand mixer fitted with the whisk attachment, or in a large bowl with a hand mixer, beat together the eggs and the sugar on medium speed until pale and the mixture forms a ribbon when lifted from the bowl with a spatula, about 2 minutes. On low speed, beat in the cocoa powder and the chocolate mixture and combine well. Pour into the prepared pan. Bake for 15 minutes. Rotate the pan from front to back and continue to bake for another 8 minutes, or until the cake is slightly firm to the touch. Remove from the oven and allow to cool on a rack to room temperature. 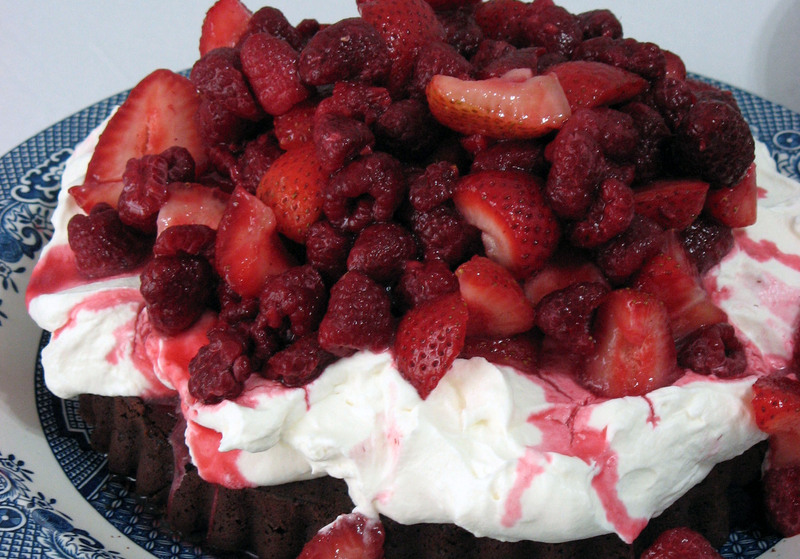 Top with sweetened whipped cream and fresh berries or other fruit. Both of these recipes look SO good. Do you have any idea what would be a good substitute for corn starch? On my diet (Specific Carbohydrate Diet), I can't have any starches or sugars. I would suggest leaving out the cornstarch if you can't eat that. It's only added to make a "marshmallowy" texture inside the pavlova -- most meringues are made without it. You may find it is a bit more crunchier rather than soft inside. We are also on a diet similar to the SCD. Try the egg whites without the corn starch or you could add a bit of gelatin. You would need to let it sit and cool after baking. I looked at meringue cookies and they do not need the corn starch. I would try it without. In the top of a double boiler whisk together the egg yolks, honey and lemon juice. Slowly add the butter, a couple of fieces at a time, whisking the entire time. Add more pieces as the previous ones melt. After all the butter is wel-blended, cook for an additional 10 to 15 minutes, stirring only occasionally, until it thickens. Set aside int the refrigerator. Another cookbook to look into is Cooking Gluten-Free with Almond Flour. I got it out of the library and ended up buying it. It is also great! We had the flourless chocolate cake last Sunday, it was much better than I was expecting! Everyone enjoyed it, not just the one girl who was gluten-free! knows what they're talking about on the web. You definitely realize how to bring a problem to light and make it important. More people ought to check this out and understand this side of your story. I was surprised you are not more popular since you certainly possess the gift.